Hello, my name is Lee (Buddah) Haverstick. I am a 52 year old father of 6 awesome young ones and adult ones. I live in the beautiful state of Michigan with my wife Dolly. I have been riding and writing sense Jr. High School. I ride a 05 Harley-Davidson FatBoy 15 year anniversary edition and a 99 Harley-Davidson Road Glide. I am the current President of the Soul Survivors Brotherhood, Northern Chapter. 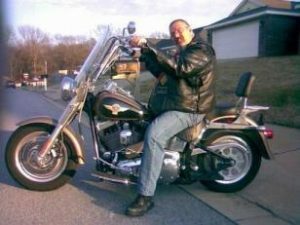 I was a cofounder, past President and Sgt at Arms of the Road Eagles Riding Club. I write to express my thoughts, pains, dreams, pleasures, desires, fantasies, my personal fight, and inner strife and for the therapeutic value it gives me. I guess in short, I write to connect the thoughts and feelings of my soul with others. All of my work is copyrighted and written under the Trademark of Black Rose Poetry. Migneault, Sharpensteen, and Scerri and other biker poets. And to those who returned. That biker wrote that poetry? Bikers can’t write like that. But he’s all tattooed and fat. That biker poet stirs in me. To write in rhyme and verse. What change will come with a Bachelors Degree? How many instructors wrote me off just by what they seen? I did not proceed and am happier now than I have been in years. reversible. Suicide is NOT THE ANSWER. You’ll find its soul with your face in the wind. It comes from within not what’s on the outside. Was realizing I needed to change my perspective. Of a two lane blacktop I’ve never seen. Dedicated to tomorrow, join me.